Corrosion of reinforcing steel is now recognized as the major cause of degradation of concrete structures in many parts of the world. Despite this, infrastructure expenditure is being unreasonably decreased by sequestration and the incredible shrinking discretionary budget. All components of our infrastructure including highways, airports, water supply, waste treatment, energy supply, and power generation require significant investment and are subjected to degradation by corrosion, which significantly reduces the service life, reliability, functionality of structures and equipment, and safety. 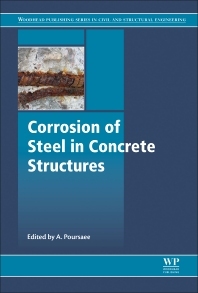 Corrosion of Steel in Concrete Structures provides a comprehensive review of the subject, in addition to recent advances in research and technological developments, from reinforcing materials to measurement techniques and modelling. This book contains not only all the important aspects in the field of corrosion of steel reinforced concrete but also discusses new topics and future trends. Part One of the book tackles theoretical concepts of corrosion of steel in concrete structures. The second part moves on to analyse the variety of reinforcing materials and concrete, including stainless steel and galvanized steel. Part Three covers measurements and evaluations, such as electrochemical techniques and acoustic emission. Part Four reviews protection and maintenance methods, whilst the final section analyses modelling, latest developments and future trends in the field. The book is essential reading for researchers, practitioners and engineers who are involved in materials characterisation and corrosion of steel in concrete structures. Researchers, practitioners and engineers who are involved in materials characterisation and corrosion of steel in concrete structures. The book will also be essential reading for undergraduate and postgraduate-level courses in infrastructure corrosion. Dr. Poursaee is an assistant professor in Glenn Department of Civil Engineering at Clemson University. He received his BS in Materials Engineering from the University of Tehran and his MS and PhD in Mechanical Engineering from the University of Waterloo, Canada. His primary areas of research include corrosion and electrochemical behaviors of metals specifically steel bars in reinforced concrete structures, concrete materials, structural health monitoring, and non-destructive evaluation (NDE) techniques. Prior to joining Clemson University, Dr. Poursaee worked as research assistant professor at Purdue University for three years and as senior engineer for more than ten years in different fields of materials engineering including corrosion, quality control, NDE and failure analysis. Dr. Poursaee has published more than 30 peer-reviewed papers, monographs, book and book chapters. He is a registered professional engineer in Ontario, Canada and serves as a member of the editorial board of the Advances in Civil Engineering Materials (ACEM) Journal, published by the ASTM.